etichetta (I) Your browser does not support any audio element. lable (GB) Your browser does not support any audio element. As early as 6,000 years ago, the Sumerians in Mesopotamia Cylinder seal used for the labeling of wine vessels. These were two to eight inches long and two inches thick cylinder of stone. The inscription or images contained on it could be unrolled on a soft tone. Essentially, this was information about the ancestry of the wine contained in the vessel. The Greeks and Romans were given little signs with information to the amphorae hanged or information engraved directly into the amphorae. Such pendants made of various materials were also in the Middle Ages wine vessels used. By "hanging around", of course, fraudulent intentions were easily possible. Important information about the wine like the vintage or a producer-sign were also by means of cork brand on the cork appropriate. Labels in their present form were introduced only from the beginning of the 19th century with the advent of lithography (lithography). However, a broad use could only be made when the problem of liability on the bottles was solved. One of the earliest examples is a Castle Johannisberger of the vintage 1822, on which the castle with the surrounding vineyards is represented. At this time also the first ones produced in England came bottles in roll form in use. Today, the label is the "birth certificate" for a wine with legally prescribed as well as additionally optional information. The most important information can be found on the main label, further information can be found on an additional neck and / or back label. More information is also on the cork possible. According to EU Regulation the product name is the essential part of the product information and the main purpose is accurate and truthful information to the buyer, avoiding misleading information. For certain parts of the text, certain font sizes or the size ratio are regulated. If no font size is given, the general principle applies Wine labeling regulations, That is, it must be easy to read, indelible and sufficiently large characters. The information must be provided in one or more official languages of the Community so that the final consumer can readily understand each of these details. Some EU countries require producers from abroad to provide certain information in their native language, which must be taken into account when exporting. For a long time, as a general principle within the EU, everything that was not explicitly allowed was prohibited. Commission Regulation No 753/2002, which came into force in 2003, meant that liberalization was widespread. This has been repealed for still wines as well as for a long time for sparkling wines this principle. There are now compulsory (compulsory) and optional (possible) indications, with the optional ones distinguishing between "indications under certain conditions" and "other indications". 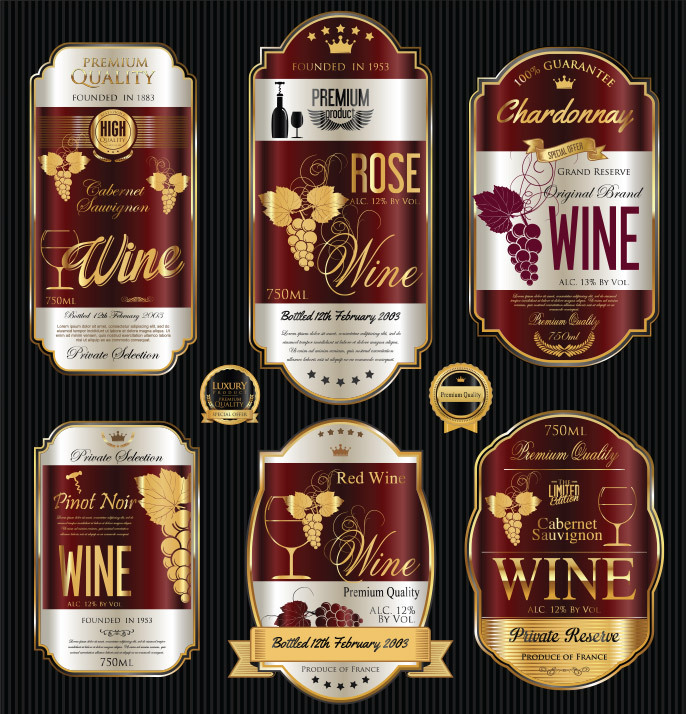 Quality: The wine must be as wine, country wine or quality wine or. Prädikatswein be declared. In this regard, the new wine names introduced within the EU from August 2009 (see detailed under quality system ). For all wines one must batch identification respectively. For quality wine / Prädikatswein must Official test number (Germany) or State test number (Austria) appear, which is alternatively also as Loskennzeichnung. For predicate wines, the predicate in question appears to be ( cabinet. choice. Beerenauslese. Trockenbeerenauslese. outbreak. Strohwein. Eiswein Etc.). The other mandatory information is bottle contents or nominal volume (For example, 75 cl with the suffix "e" for calibrated), existing alcohol content (in% vol in full or half units or in degrees), as well as name (company) of the bottler indicating the country, municipality of the head office and actual place of delivery. awards : z. B. "Gold at International Wine Challenge "
vintage : "Read" or "harvested" with reading date, "hand-picked" or "hand-harvested"
The "other optional data" are characterizing properties about odor and taste ( fruity. fresh. tangy, discreet acid etc. ), Consumption Recommendations for storage, optimal wine temperature or suitable Food, Details of the history of wine or winery, natural or technical conditions (area, climate. vintage ), Vineyard names ( individual layers. Rieden ) and explanations (eg for Eiswein). This page was last modified at 14 April 2019 at 18:42.